Every once in a while I will see content on a website that has no place being there. I understand that some web marketers will put up any content, just to have content, but in this case I don’t think that’s what they were going for. There are a couple of websites that are geared to publish any topic in on the web like eHow.com and wikipedia. 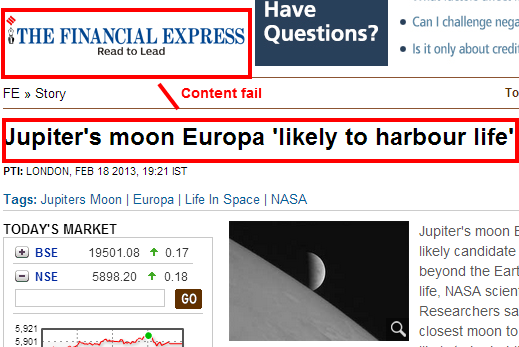 But if you are a financial blog talking about space exploration, then your readers might be like “WTF?” and move on with their lives. Was there any harm done in the end? Probably not, but I like to keep my content somewhat on target. NASA announced last year that there are currently no funds for the mission. This entry was posted in Inbound Marketing by Russell Jensen. Bookmark the permalink.